An important part of being a canny gardener is thinking about how to do the most with least (thereby save money). Some could be about buying perennials, some could be about plants that re-seed/re-grow by themselves every year and some about plants that do two or three things. Here are some easy plants that have worked for me because they are easy, need little watering and resistant to common pests while attracting bees and good insects. Eating and looking/smelling good– Edible Chrysanthemums, Chopsuey greens (extreme right), pansies and lavender. Shown below (left) is the edible chrysanthemums and my thai rice noodle made with it. 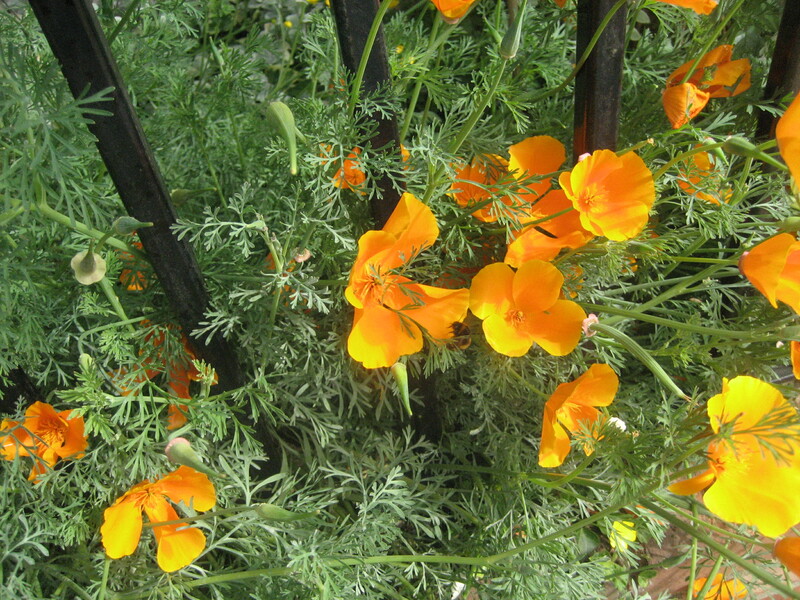 I am going to use the flowers and the pansies, along with the nasturtiums to make a ‘flower salad’ later. Buy one and get many for free– Calla lilies, Hosta, Alpine sedum, mint (both mint and sedum work well as ground cover, saving time on weeding. Shown below is my Hosta plant which has had many babies and survived slug onslaughts (slugs love Hosta). When the leaves are young, you can eat them as greens. Reseeding by themselves- Mexican Daisy, poppies and Marigold. White flowers spring through fall. All needs medium to low water. With the daisies, you can also divide and get many from one small pot that you buy. Perennials– Clematis, Agapanthus, Lobellia Fan Scarlet, Canna (many of the South African flowering plants will also grow in the UK and Europe, needing only little watering and care and producing gorgeously vivid blooms) . Shown from left to right are the Californian poppy (that occasionally becomes perennial!, calla lily and agapanthus, Erysimum (Bowles Mauve) and Clematis. Useful weeds– Herb Robert, Dandelion, common geranium, nettles- I have got these free from the heavens- they are medicinal herbs, good for bees and grow with no problems! 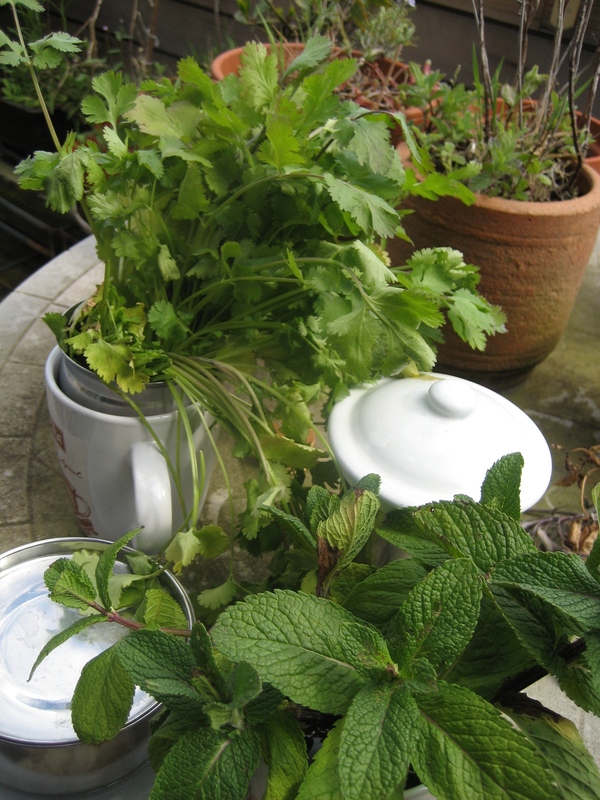 Shown below are nettles which I use for food, fertiliser and tea and also wild geraniums. Categories: balcony, beauty, container gardening, experiment, growing, insects, patio garden, planting, recipe, saving money, slugs, watering plants, weeds, zero waste | Tags: attract bees, beneficial, birds, concrete patio, container, Cooking, easy receipe, free, gardening, gardens, herbs, lazy gardener, nettles, pests, re-use, wild, wildflowers | Permalink. Plan ahead for the week, on a daily basis. Use coupons and reduced price food wisely- don’t buy reduced price food just because it is reduced and give away coupons you won’t use. Buy what you need or what you will definitely eat (do try a new food once in awhile!). Do not be tempted by BOGOFs and money off coupons unless they are about what you would buy anyway. Store food correctly at the right temperature and place- many food such as bananas and avocados do not need to be stored in the refrigerators. Cook the right amount. I use things like yoghurt and fruit to supplement if one person says they are hungrier that particular day rather than making more food. Store leftovers for later use. If you really must throw, then see if you can compost it. 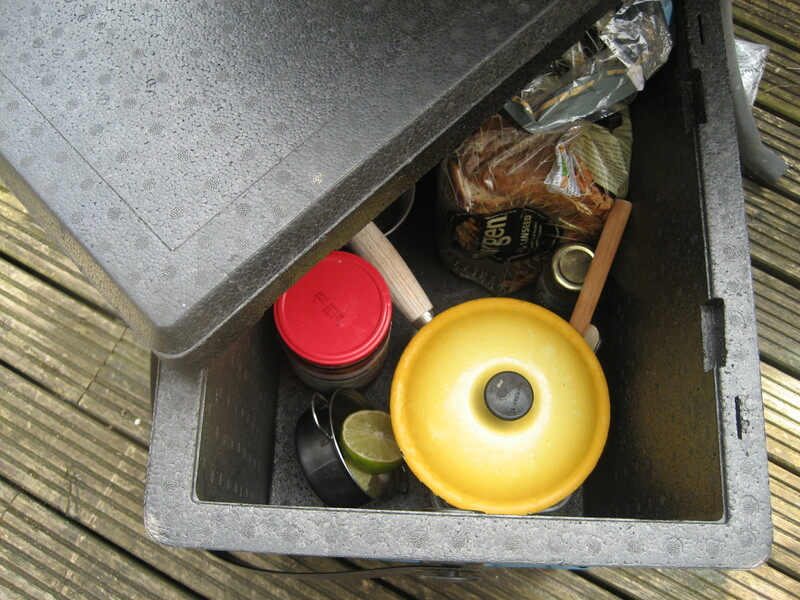 Many food items such as meat can’t be composted. Some food can be eaten by pets and animals such as pigs but again check before giving it to them. Check your freezer is below 5C- your chicken and greens will last three days longer. Bread gets stale in the fridge six times faster, so divide your bread and store excess in the freezer. You can easily defrost it by leaving it out or using the microwave. You can also divide other food into smaller portions for freezing. Ice cube trays are handy for freezing juices, milk, tomato sauce, herbs into small portions that can used as needed. Cut vegetables into pieces and freeze- these are very handy for quick stir fries. You can also freeze eggs, cheese, chopped bananas, summer fruits and cakes. Categories: storage | Tags: Bananas and Plantains, beneficial, container, Cooking, easy. hardy, food, freezer. tips, fridge, greenhouse gases, ice cube trays, leftovers, storage, waste | Permalink. I returned from a three week holiday to find that there had been storms in the UK and my little garden was a little wrecked. 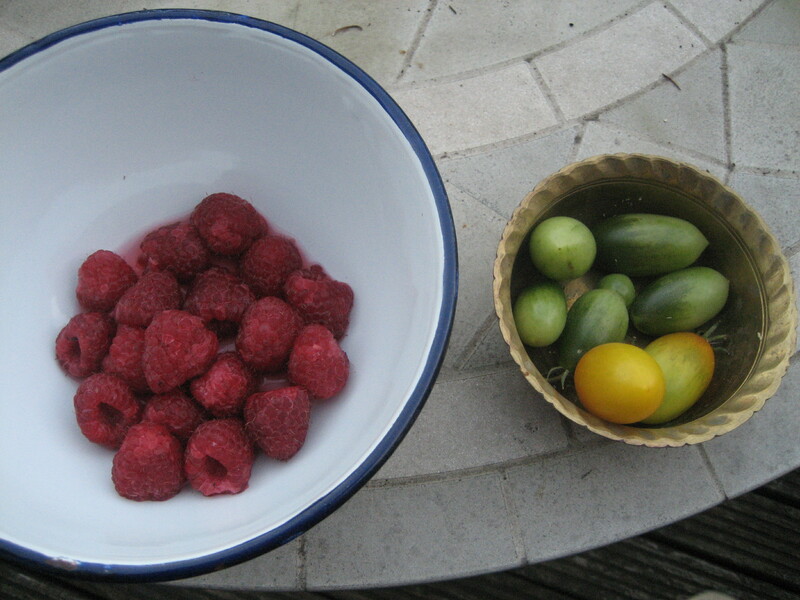 My prized crop of italian plum tomatoes which had not ripened were on the deck and there were raspberries which needed to be eaten, otherwise they’d go off. 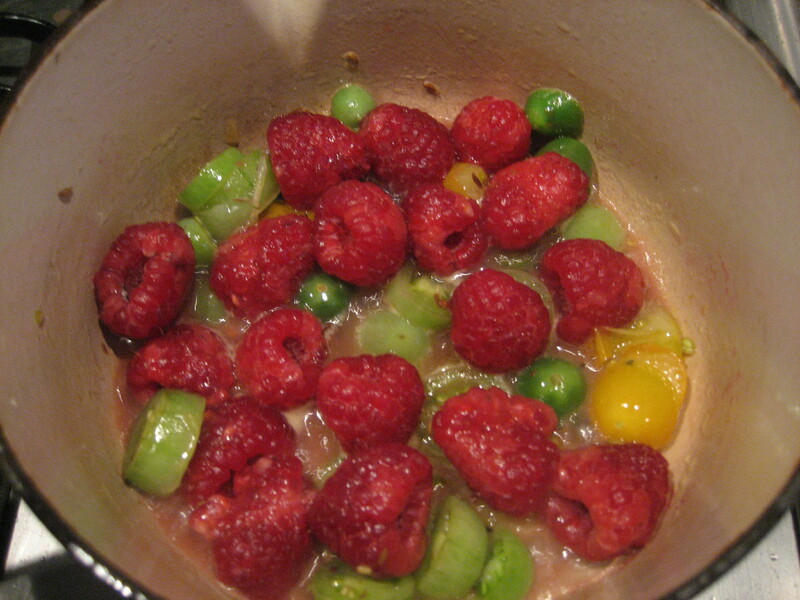 Well, we ate as many raspberries we could and then I thought about making a chutney with the rest. Chutneys which originate from India are an accompaniment to a main meal, eaten at the end. In the West, chutneys are eaten with crisp breads, cheese, salad and meats- just about anything. Molasses are used in traditional Indian cooking, sugar being an unknown ingredient. I also added a pinch of turmeric. After less than 15 minutes, the chutney was ready. 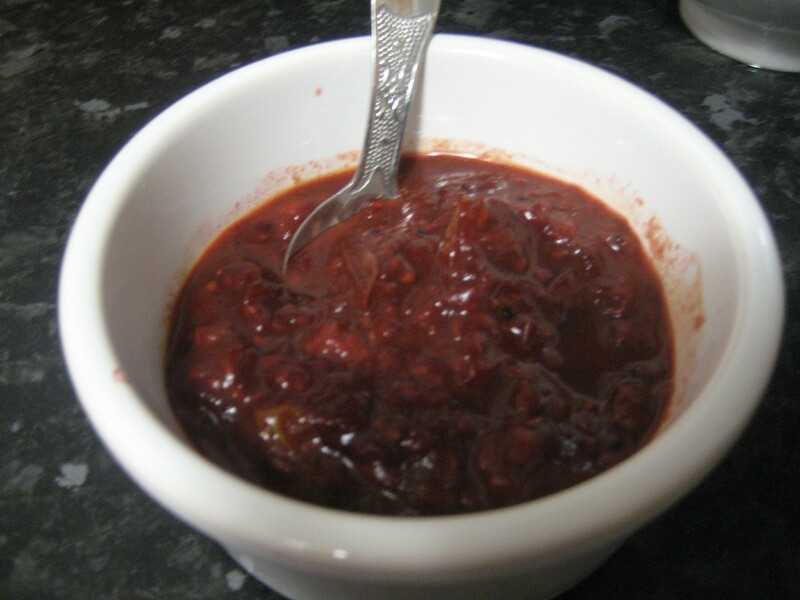 With a bit of zing- this is a delicious chutney! Categories: houseplants, recipe | Tags: abundance, chillies, chutney, Cooking, Cumin, fenugreek, Indian, molasses, raspberries, sugar, summer, sunflower oil, tomatoes, turmeric | Permalink. Wet Garlic may appear in many vegetable boxes now. I was enticed by the name but I did not know how I could use it. Wet garlic is called so because it has not been hung up to dry. It has to be picked by hand; a very lengthy process. During its short season it is very much sought after by gourmets. My wet garlic actually came from France where it is well used. The juicy cloves (you can see how the cloves will form if you cut through it) are less strong than dry garlic. So wet garlic can give food like soups a particularly creamy, even sweet flavour. The creamy cooked garlic is delicious spread on toast or mixed with butter and used on vegetables or in baked potatoes. Here are two other quick ways I used it. I used up some fat left behind from grilling pork left on the baking dish. 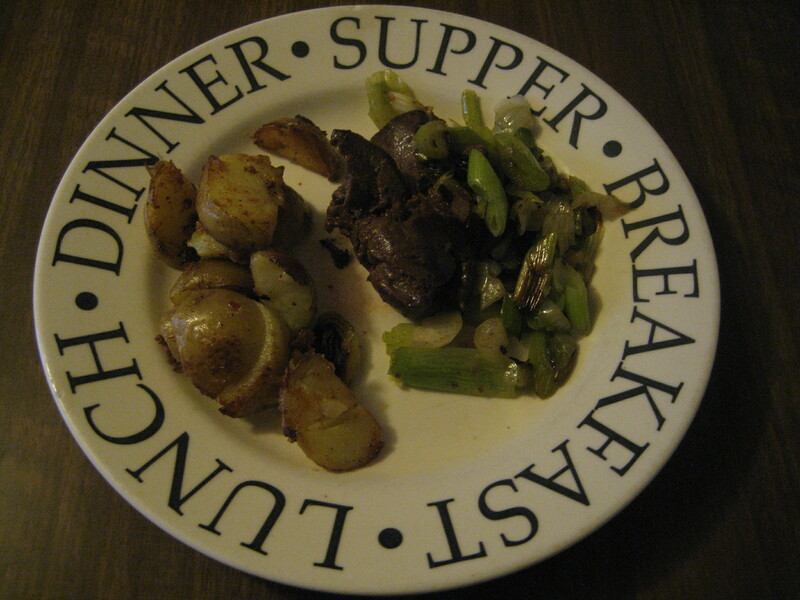 Being a lazy person, I put the whole thing on the hob, fried the potatoes first because they take the longest, then added the chicken livers and then the chopped up wet garlic. It took 20 minutes to do, make sure the liver is cooked through. I added some salt and pepper to flavour and voila! a healthy simple meal. The pork fat was used up in the cooking so not much cleaning up to do afterwards. Again another simple dish. 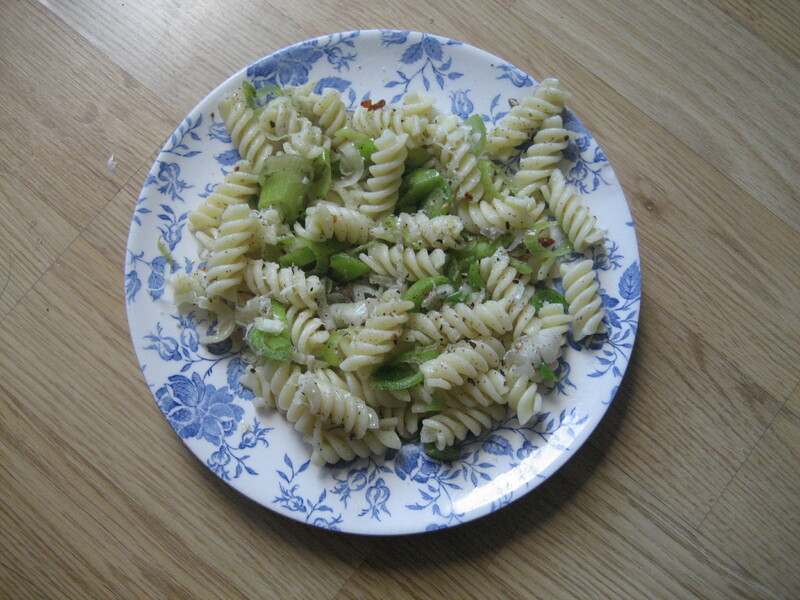 I sweated out the chopped up pieces of wet garlic, added some anchovy and pepper with some left over pasta- ready in less than 10 minutes! Bon appetite! 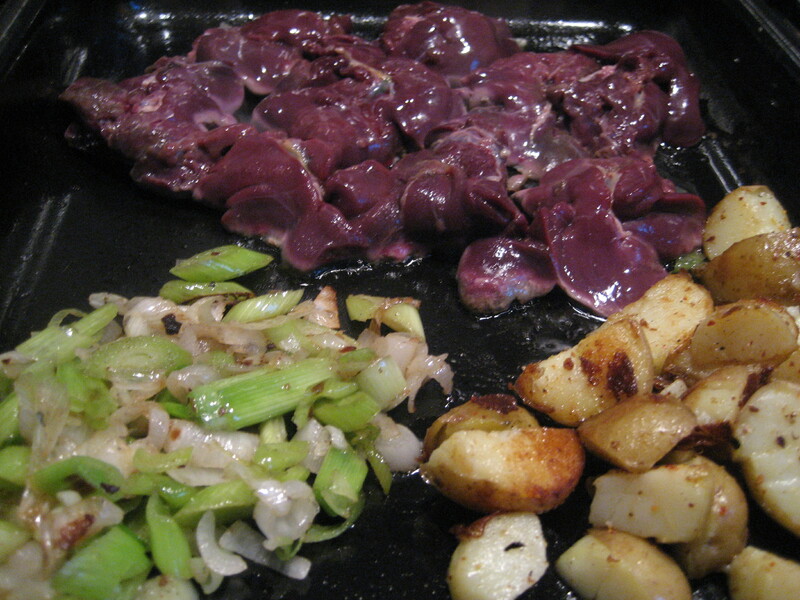 Categories: recipe | Tags: chicken liver, Cooking, dripping, France, healthy, pasta, pepper, potatoes, quick, quick dishes, simple, wet garlic | Permalink. Nettles grow wild in the UK and most throw them away as weeds. However, nettles are quite nourishing with health restoring properties. It is a slow-acting nutritive herb that gently cleanses the body of metabolic wastes. It has a stimulating effect on the lymphatic system, enhancing the excretion of wastes through the kidneys. Nettle contains iron and vitamins C and K. It is reportedly specially beneficial to pregnant women. It is also anti-lithic and nephridic, breaking down stones in the kidneys and gravel in the bladder. 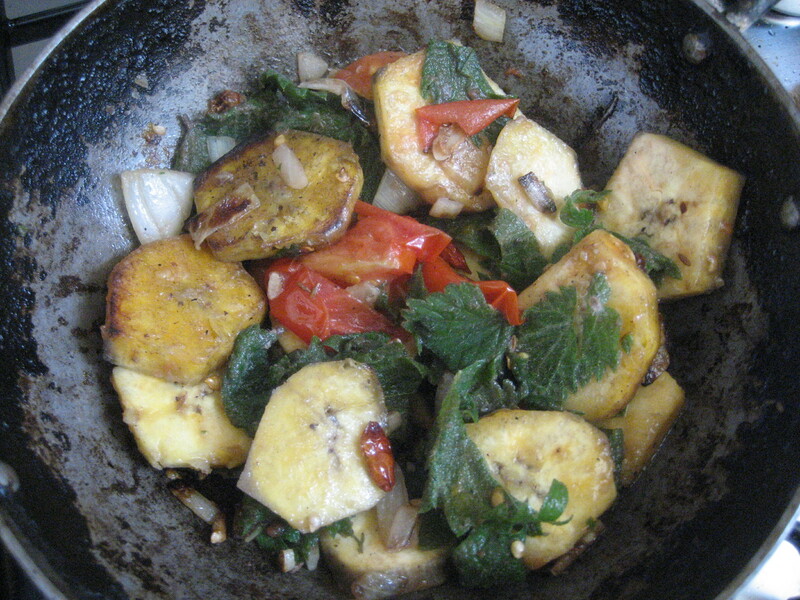 I had a recipe for a spinach and banana dish in which I decided to swap for nettles and plantain. I used plantain instead of banana to overcome any possible strong reaction with the bowel because plantain slows it down. 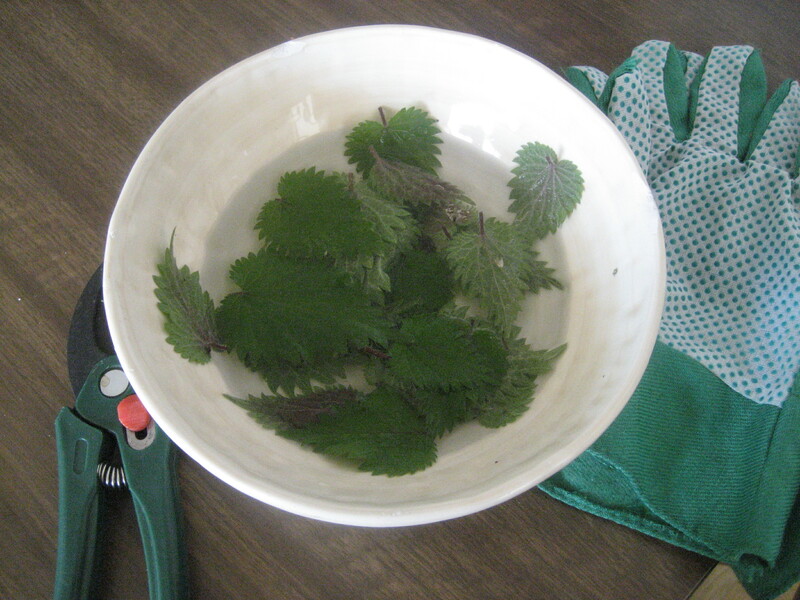 Pick the nettle leaves carefully and put them in some hot water which makes them stingless and then they can be chopped up roughly. To couple of spoons of hot oil, I added a pinch of cumin seeds and birds eye chillies and fried for 1-2 minutes until the cumin seeds were puffed up. 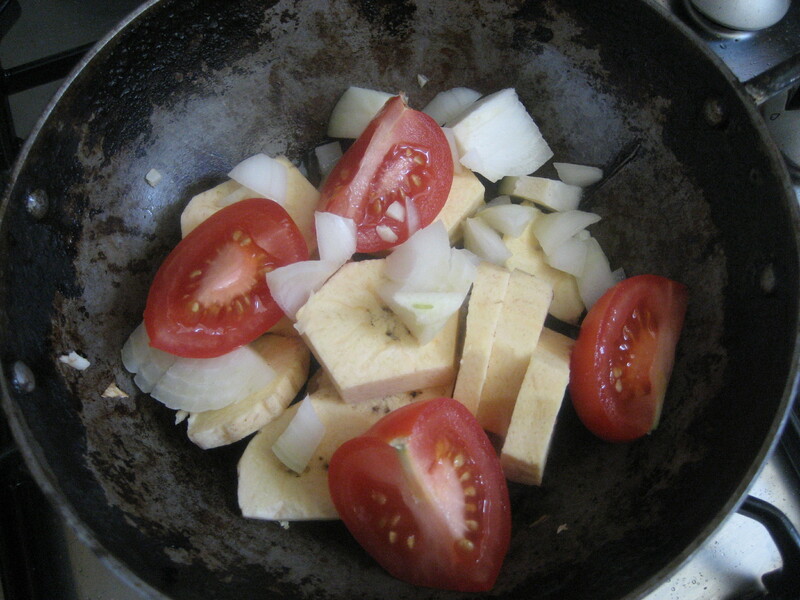 Then I added four chopped garlic cloves, half chopped onion and one tomato, quartered, along with the sliced plantain and chopped nettle leaves. Stir until all done- takes about 4-5 minutes with a lid on during last few minutes. Serve with rice and salt to taste. Categories: recipe | Tags: Bananas and Plantains, beneficial, Coconut oil, Cooking, Cumin, Fruit and Vegetable, health, Home, Nettle, nettles, plantain, recipe, restorative, value | Permalink.